This comprehensive policy helps ensure that employees know procedures and obligations during periods of unplanned absence, whether due to sickness or some other reason. The document aids employers with compliance with Employment Rights Act and other employment legislation. Unplanned employee absence can be a significant cost for a business. This document covers leave for sickness and for other emergency situations. While employment law gives employees certain rights to leave in some circumstances (notably sickness), they also have obligations to their employers. There are also situations where employees do not have rights to automatic leave (such as a boiler breaking down at home), but where a conscientious employer will want to help and motivate staff by giving additional rights. 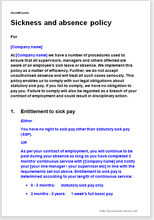 A policy document such as this one should make employees aware of their rights and obligations. Although it can't prevent employees abusing their rights, it should clarify the rules, so that if an employee steps too far out of line your business can take appropriate, fair, action. It acts as both a reference point for employees and managers when unplanned leave is taken and can help support an employer in dispute over leave. This sickness and absence policy can be adapted for a business with any number of employees and in any industry.